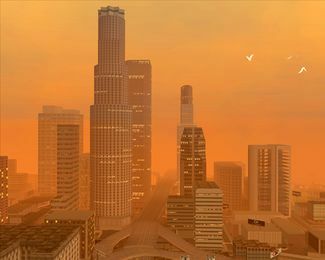 Downtown Los Santos in GTA San Andreas, as viewed to the north. The radius of the district. Downtown Los Santos is a district of Los Santos, San Andreas, and is modeled after Downtown Los Angeles. This is the location of the city's tallest structures, as well as numerous small businesses and public facilities. Downtown Los Santos sits just north of Pershing Square, the location of the city's municipal government. Also adjacent to the area are the districts of Temple, Market, Commerce, and Glen Park. 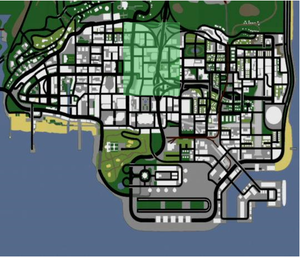 The major highway that connects Los Santos International Airport (LSX) with Las Venturas bisects Downtown Los Santos into eastern and western portions, and establishes a connection with the highway servicing Ganton, Jefferson, and East Beach just south of Downtown. Just north of downtown is the Mulholland Intersection, connecting the LSX-Las Venturas highway with the boulevard servicing Rodeo, Richman, Vinewood, Mulholland, Temple, Glen Park, Jefferson, Las Colinas, Los Flores, East Beach and East Los Santos. This district exists in the GTA IV Era, as a supermarket in the area can be seen on TV. This page was last modified on 23 June 2013, at 21:22.